Engines are generally most efficient when they run at a constant speed within their design range. That’s why you get better mileage on the highway than in town; it’s why gasoline-powered generators don’t typically have multiple power settings, and and it’s why airplane engines are designed to run for very long periods of time at a steady constant power output. It turns out the fact holds for endurance athletes. It’s well documented that one of the most effective ways to train for cycling events is to monitor your power output using a power meter. The idea is simple: when you’re riding outdoors, your speed and heart rate will vary widely due to factors you can’t control. On a flat road with no wind and cool weather, you might go 25mh at a certain heart rate. Into a headwind, or uphill, or in an Alabama summer, you might be working just as hard but only going 10mph. So trying to control your workout by pace or heart rate is needlessly difficult and may not give you the results you want. A power meter measures how hard you work, not how fast you’re going or how hard your heart alone is working. Without going too deeply into the complexities of training with power (see this free e-book if you want to know more), the basic idea is that you build your training plan so that you try to put out a certain amount of power, no matter what the road and weather conditions are. I started doing this a little while ago and it’s really useful– my coach will say “make X watts” or “your race target for the 70.3 distance is Y watts” and I just pedal hard enough to hit that number. My speed may go up or down depending on wind and hills, but my effort stays constant so I don’t accidentally work too hard trying to go fast into the wind (for instance) and leave myself unable to sustain my pace later in the race. The folks at Stryd have built a similar tool for runners: the Stryd power meter is a little pod that clips on to your shoe and measures the amount of force you produce when you run. Since running uphill or into a headwind is harder than running on level ground, or in still air, they intend their product to be used by people who want to control their pace through power management. The problem is that the cycling world is much further along in embracing power, so it’s hard to actually see what your running power is, much less pace to it. Garmin watches can display power data from Stryd pods, and Stryd has a nifty web app called PowerCenter that gives you a bunch of analytics.. but what I wanted was a real-time, on-the-wrist alert that would tell me when I was making too much power, or not enough. 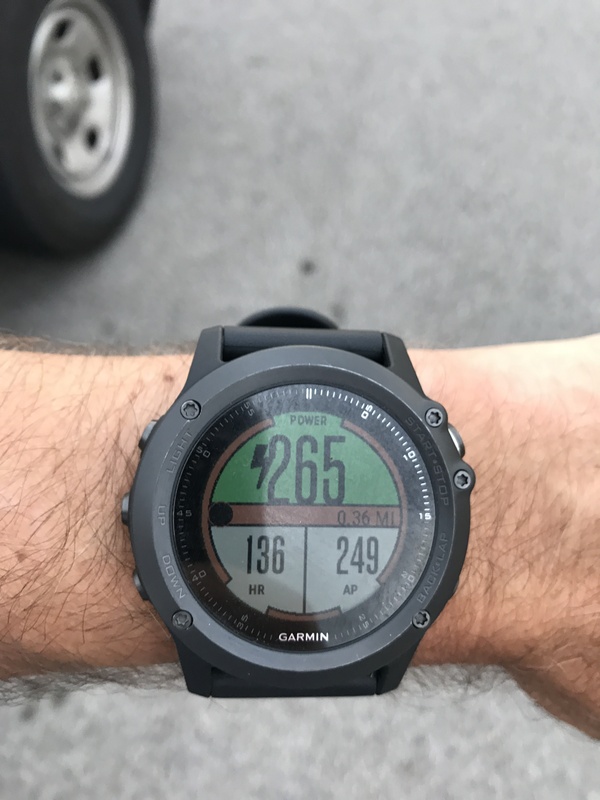 Garmin (and many other manufacturers) allow you to set alerts that will buzz or beep when you go outside the predefined pace, speed, heart rate, or distance targets. I wanted one for power… and now I’ve got one. 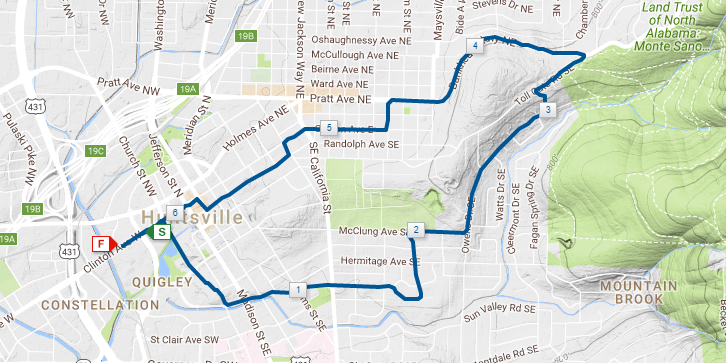 I played around with the app a bit and couldn’t get it to work reliably but Gus Nelson of Stryd was kind enough to do some live troubleshooting with me via Google Hangouts and we got the problem sorted out, so I used it for this week’s Cotton Row 10K. Executive summary: it worked flawlessly and gave me useful cues when I was going too fast, or too slow. I got a 45-second PR, which would have been more if I’d set my power target higher. I hadn’t done the recommended power test, so I was guesstimating what my power level should be; I could have gone a bit harder. Cotton Row is a tricky course: it’s got a big hill about mile 3 and many a runner has come to grief by blasting across the start line and burning up too much energy. You may also want to check out the live version, where you can see more clearly the ridge that we run along between miles 3 and 4. The red line is my heart rate; the purple line is power. You can clearly see where I walked aid stations or where I took a break to regulate my power output; you can also see my finishing kick. So what’s the bottom line? I really like the idea of training and running with power. It’s a proven technique for the bike. I did a good job of holding in my power target range, and I did get a (small) PR, but I probably could have done just as well by running by feel alone. I think the missing ingredient is that I don’t really know what my target run power is. Once I have that dialed in I will be better able to fine-tune my pacing. I’ll keep using PowerRace and see how it goes.